A growth capital fund focused on the Consumer Goods & Services, Distribution and Logistics, Agri-business, and Healthcare sectors in Algeria, Morocco and Tunisia. In the ‘New Normal’ world in which we are living, investors must either invest in liquid, safe assets that have negative returns or in illiquid assets that are considered extremely risky. 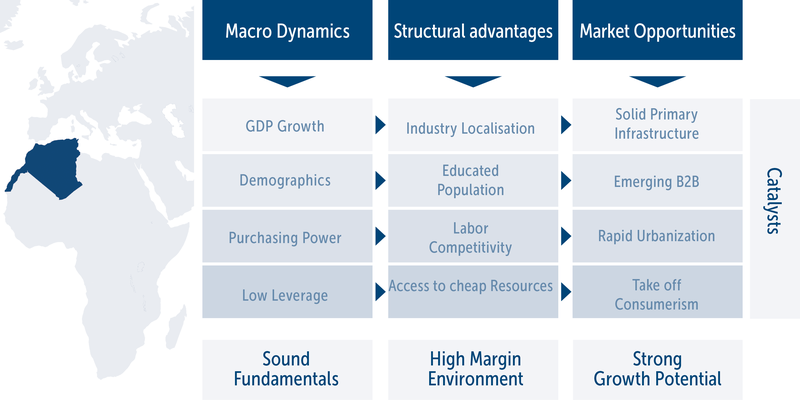 Few major global industries experience the same peak-to-trough variations as those of the maritime sector. This presents a strong investment opportunity. Algeria is one of the last developing market success stories and the time is ripe to invest in the country’s future. As the global economy recovers, the global luxury industry is growing as well. Years of slower but sustainable growth will be the trend going forward. Renewable energies represent the future, with wind, solar, and hydropower becoming increasingly relevant in the context of total percentage of global energy consumption. Increasing the role of the stock market in project financing will help to diversify economic activity away from dependence on hydrocarbons.